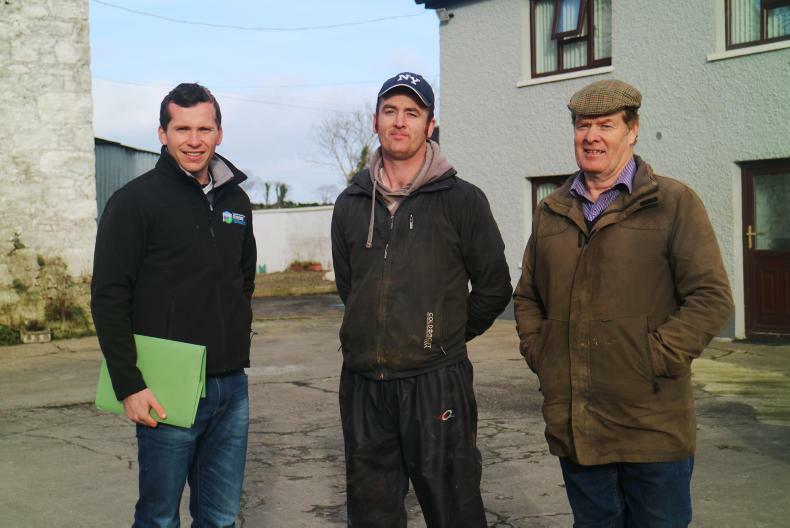 Matthew Halpin visited the Grieve farm in Donegal last week for an update on the farm's progress. A bull in the under-16-month system. Adviser John Greaney with John and Gerard Grieve. All 2018-born males are being finished. Calves sired by the new CF52 stock bull. Father and son partnership Gerard and John Grieve are the Donegal participants of the Teagasc/Irish Farmers Journal BETTER farm beef challenge. The land base comprises of 45ha, a portion of which is leased in. The land would be described as predominantly heavy. Gerard and John are running a suckler and sheep system. Since the commencement of the BETTER farm programme, suckler cow numbers have increased from just above the 30-cow mark to 40 suckler cows. In turn, ewe numbers have decreased slightly to just over the 100 mark. The farm system has also undergone a slight change, with all male progeny now being brought to under-16-month bull beef – a shift away from what used to be a weanling system. Last year, 10 2017-born bulls were finished under 16 months as a trial. Satisfied with the performance of these bulls, all male progeny from 2018 are now in the shed for finishing in this system. 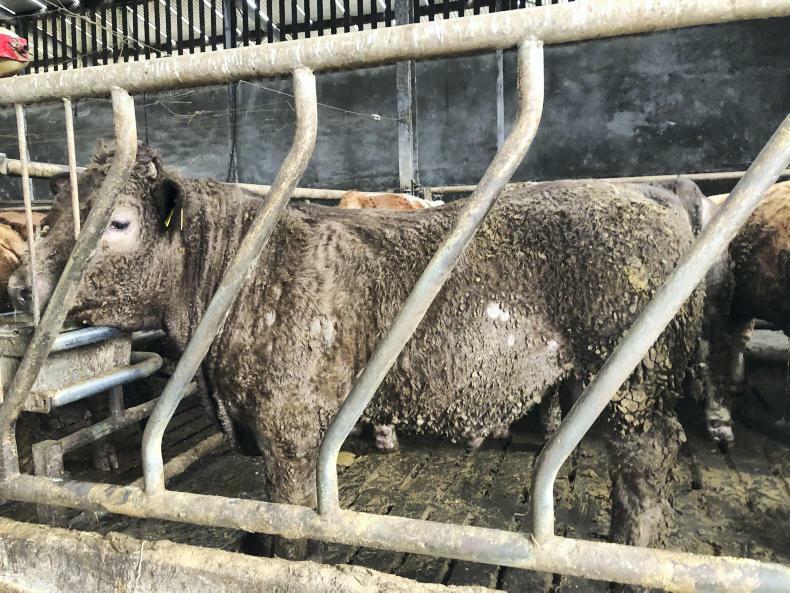 Down the road, the Grieves are even looking at the option of constructing a finishing shed and purchasing in bulls to go along with their own stock to supplement output and gross margin. A small batch of dairy bull calves were purchased in this year and reared. They are currently housed and will be turned out to grass as early as possible, with the plan being to slaughter these at 20 months. 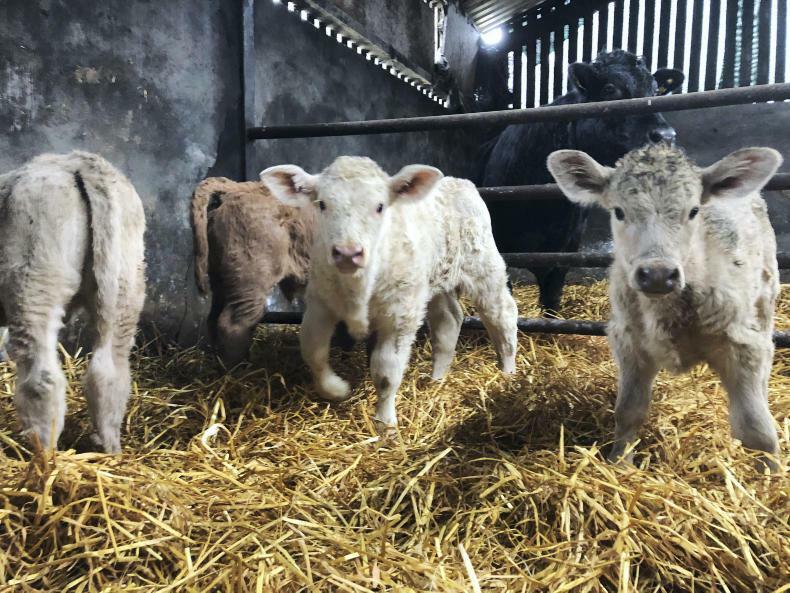 Not fully sold on the system, John and Gerard are not planning on buying dairy calves this spring and will instead opt to hold on to their heifer weanling for the winter as opposed to selling them as weanlings. Last year was an excellent year for the farm. Given the heavy nature of the land, it was a bumper year in terms of grass growth. Looking at Pasturebase figures, in excess of 3t DM/ha extra grass was grown over the course of the year. This is further reflected in the fact that the date for making second-cut silage was six weeks earlier than the previous year and even allowed for an unprecedented third cut to be made. Performance was also very high. Scanning saw 41 females out of 42 in-calf, while average daily gain for the bull calves was 1.2kg throughout the summer and autumn. Those 41 females scanned in-calf have just begun calving, which will continue until mid-March. Martin Downes farms 84ha of good-quality land just outside Multyfarnham in Co Westmeath. Roughly half of the farm is in grass while the other half is sown in tillage. The livestock enterprise is mixed suckler-to-beef and sheep operation. The suckler herd comprises of 110 spring-calving cows. The best of the male progeny are slaughtered out of the shed under 16 months of age, with the remaining bulls getting a second season at grass for slaughter at 20 to 22 months. 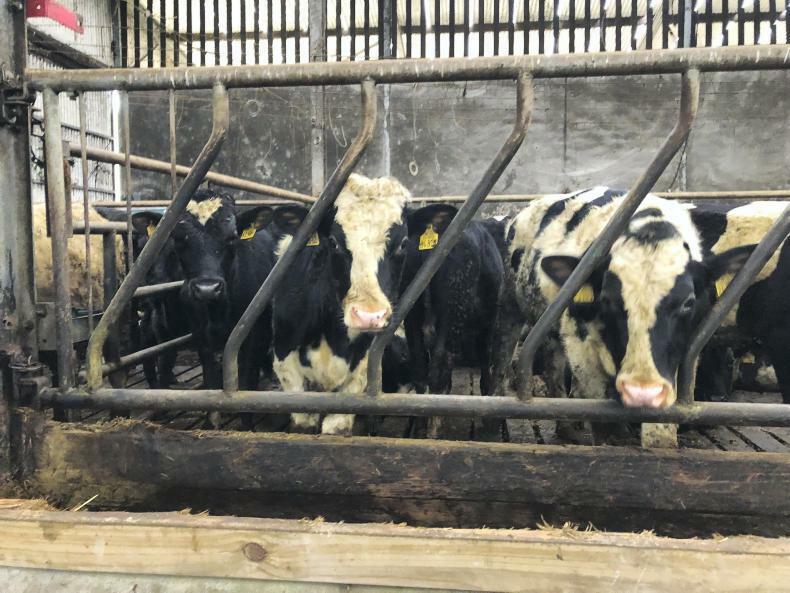 Once replacement heifers are drafted off, surplus heifers are slaughtered at 20 to 22 months of age, off grass where possible. As things stand, there are currently less than 20 cows left to calve. 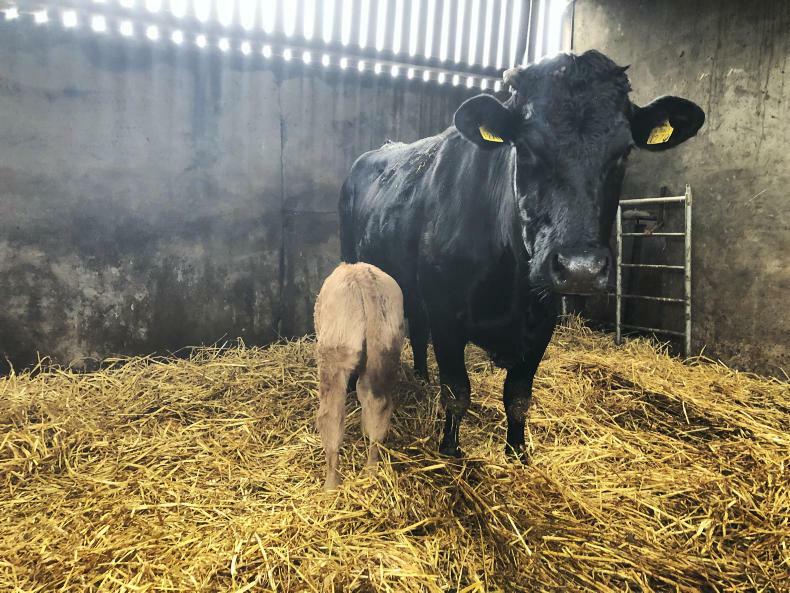 Ideally, calving should be complete by now, but Martin explained that due to the drought occurring right in the middle of the breeding season last year, there was a lot of pressure on stock bulls and cows. 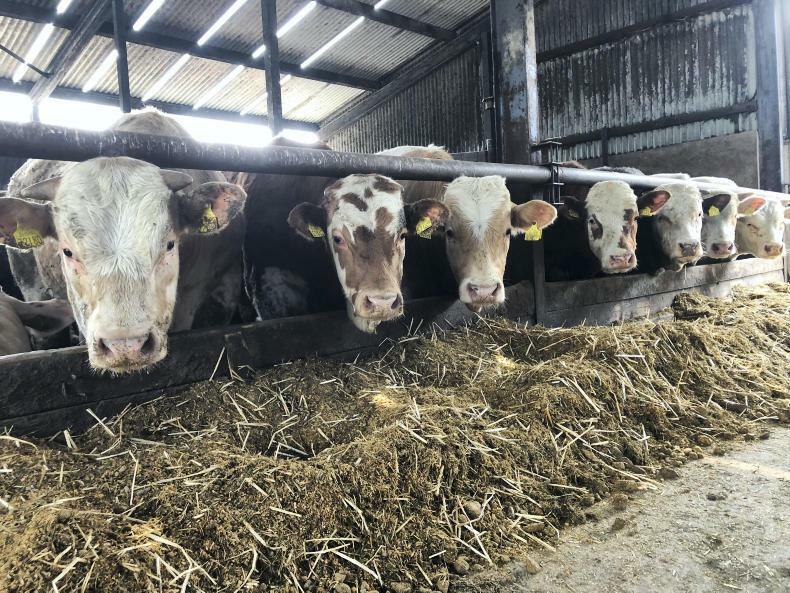 "After we scanned the cows last autumn we knew there was going to be a break in the middle of calving, and it coincided with the extreme heat,” said Martin. Calving has so far gone very well, with few mortalities. “We had a student in from Balllyhaise for the spring which really gave a push on with the work. 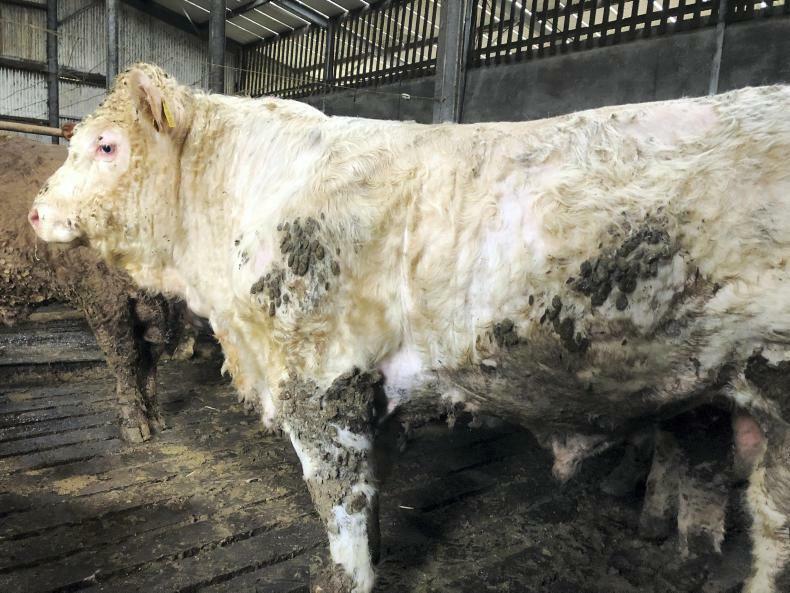 I’d be very stringent when it comes to frequent cleaning, disinfecting and bedding of calving sheds and pens." Typical cows on Martin Downes' farm. With calving drawing to a close, breeding is just around the corner. Calves are being dehorned and vaccinated for clostridial disease at appropriate ages, while their mothers are receiving BVD and IBR vaccines. Leptospirosis vaccines can’t be sourced at present. Breeding is due to start on, or slightly before 1 May. A Charolais, Angus and Salers bull are on the farm at present. The Salers bull will run with the maiden heifers. The herd’s Simmental bull was culled last year so a decision is yet to be made on a replacement. Bulls destined for slaughter under 16 months are being built up to ad-lib finishing at present. Their diet currently consists of 8kg concentrates, 10kg fodder beet and silage and straw. As the fodder beet is almost gone, concentrate levels will be built up to 12kg over the coming weeks. For the finishing period, the diet needs to be very high-energy and low protein. Energy drives weight gain and helps to lay down fat. During the store period over the winter, protein is important for growth. “The store diet included half a kilo of soya to help grow the frames of the bulls”, Martin said. The bulls are currently averaging 505kg at just over 12 months of age. Target liveweight at slaughter is around 700kg so, with a kill out of 58%, a carcase weight of 400kg is the objective. Average carcase weight in 2018 was just below this at 390kg. Looking at the averages, another 195kg needs to be put on in around 110 days. This equates to a target daily gain of 1.77kg. The animals are currently doing 1.5kg/day, which should increase as concentrate levels rise. Last week's discussion group in conversation with BETTER farm adviser Tommy Cox. Much of what is explained in this article was discussed at a discussion group day on Martin’s farm on Thursday. To learn more about the new BETTER farm discussion groups, see this week’s Irish Farmers Journal in print or online. Discussion groups have become quite common in farming in recent years. Facilitated by specially trained agricultural advisers, they allow farmers to meet regularly to discuss technical issues, share information and solve problems. There is also a strong social aspect to discussion groups, something that is much needed in what can be a very solitary occupation. The Knowledge Transfer (KT) Programme was launched in 2016. The objective of the scheme is to upskill farmers, to encourage efficiency and effectiveness of work and ensure farmers engage in a process of continuous improvement which will help to develop their enterprise. A payment of €750 is paid to each participant for every year completed within the programme. Three meetings and two DAFM-approved national events. 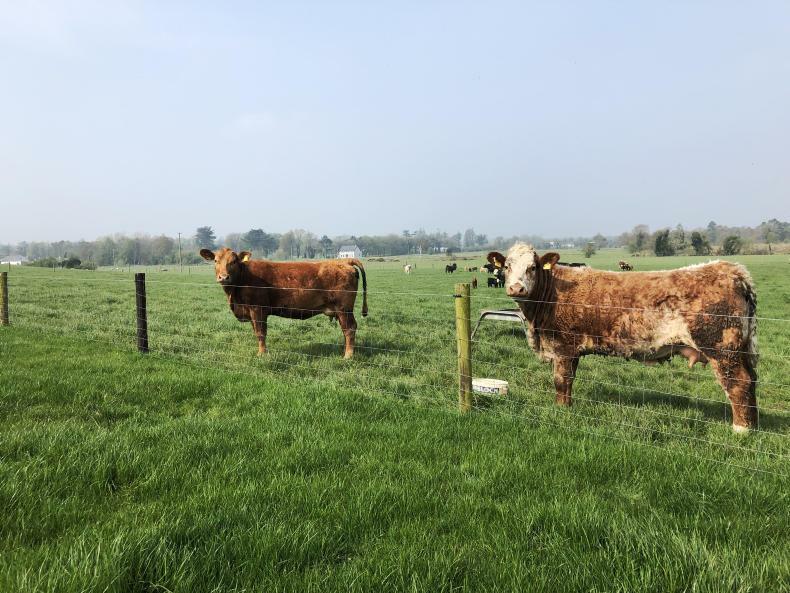 The current phase of the Teagasc/Irish Farmers Journal BETTER farm beef programme, and indeed the previous phases of the programme, hosted numerous national events, all of which were approved by the DAFM for qualification within the KT programme. Eight events were held last year – two in the spring, two in the summer and four in the autumn. 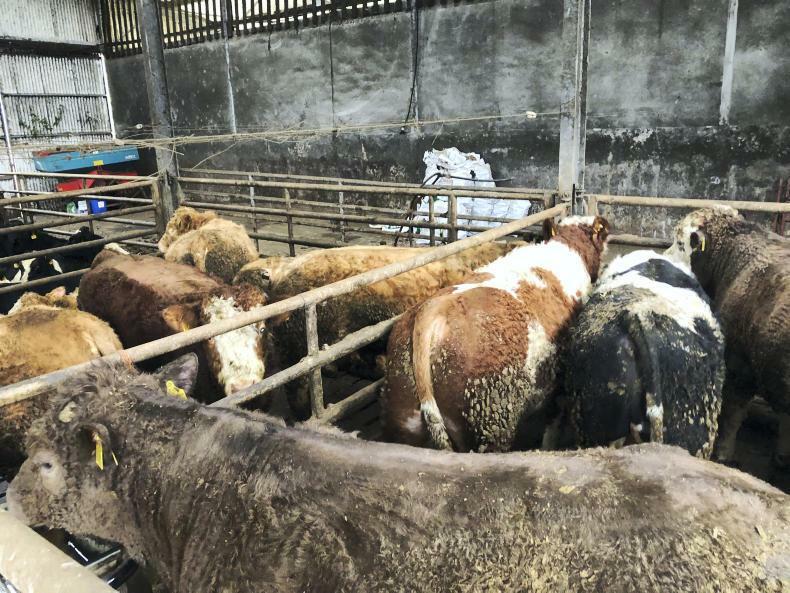 Two events recently set the ball rolling once again for 2019, with Waterford farmer Maurice Hearne and Kildare farmer Ricky Milligan hosting national events on their respective holdings. A further four are planned before the year end. These are national events, however, and as already highlighted, only a maximum of two can be used in any one year for compliance within the KT scheme. The 24 farms within the BETTER farm beef challenge are now set to become a whole lot more accessible to farmers from now on, however. In addition to hosting national events, each farm will be opened up to between four and six discussion groups in the year. This now gives the opportunity for close to 150 discussion groups to attend BETTER farms for meetings. What makes the prospect even more exciting is the wide range of farms within the programme. 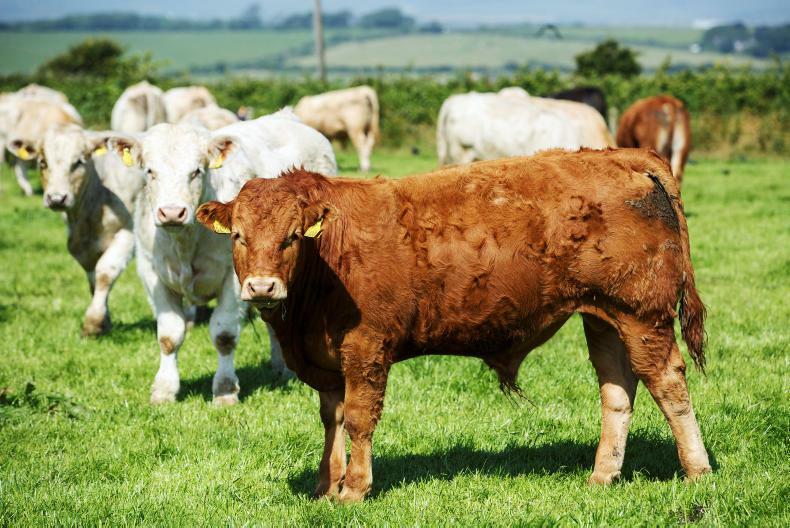 Holdings ranging from 18ha to 123ha, are run by full-time and part-time operators and include a broad range of systems from suckler to beef, suckler to store or calf-to beef. Many are also mixed, with either sheep or tillage present. Each of the BETTER farm beef challenge participants has, over the last two years, been constantly striving to improve performance on their farm by up taking the best advice and technologies available. This new discussion group feature within the BETTER farm programme will now give visiting farmers the opportunity to see and discuss first-hand the practices on the programme farms that have been featured at national events and in the Irish Farmers Journal each week. The BETTER farm participants must be commended for their willingness to host these discussion groups considering the time that they will have to give up. However, the learnings from discussion groups are often two-fold, with the potential for host farmers to benefit from fresh pairs eyes on the farm. 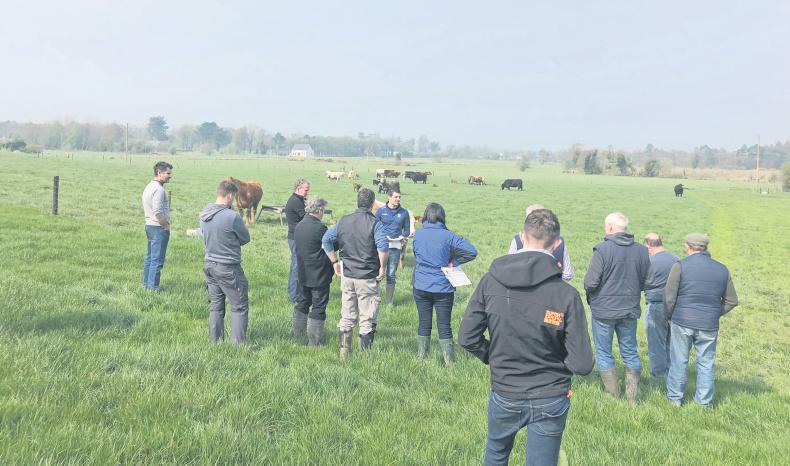 Each discussion group will be facilitated by one of the Teagasc BETTER farm advisers – Martina Harrington, Tommy Cox and John Greaney – as well as each group’s own facilitator. Given the current difficulties being experienced within the suckler and beef sector, this new discussion group model should be seen as an attractive opportunity for farmers to take on board new learnings. Mixed suckler-to-beef, sheep and tillage operator Martin Downes hosted two discussion groups on his farm in Multyfarnham last week. Calving and bull finishing were the key points discussed. Bulls destined for slaughter under 16 months are being built up to ad-lib finishing now. At present, the diet consists of 8kg concentrates, 10kg fodder beet and silage and straw. As the fodder beet is almost gone, concentrate levels will be built up to 12kg over the coming weeks. It was explained that for the finishing period, the diet needs to be very high-energy and low protein. Energy drives weight gain and helps to lay down fat. During the store period over the winter, protein is important to grow the bulls. “The store diet included half a kilo of soya to help grow the frames of the bulls,” Martin said. The bulls are currently averaging 505kg at just over 12 months of age. Target live weight at slaughter is around 700kg so, with a kill out of 58%, a carcase weight of 400kg is the objective. Average carcase weight in 2018 was 390kg. Looking at the averages, another 195kg need to be put on in around 110 days. This equates to a target daily gain of 1.77kg. They are currently doing 1.5kg/day and this should increase as more concentrates are allocated. With participating farms now entering their third year of the programme, farm plans are beginning to take shape and good progress is been made. The discussion group concept was introduced this year to get more traffic through the BETTER farms and give local groups the chance to see what changes have been made on farms and how they are impacting performance. 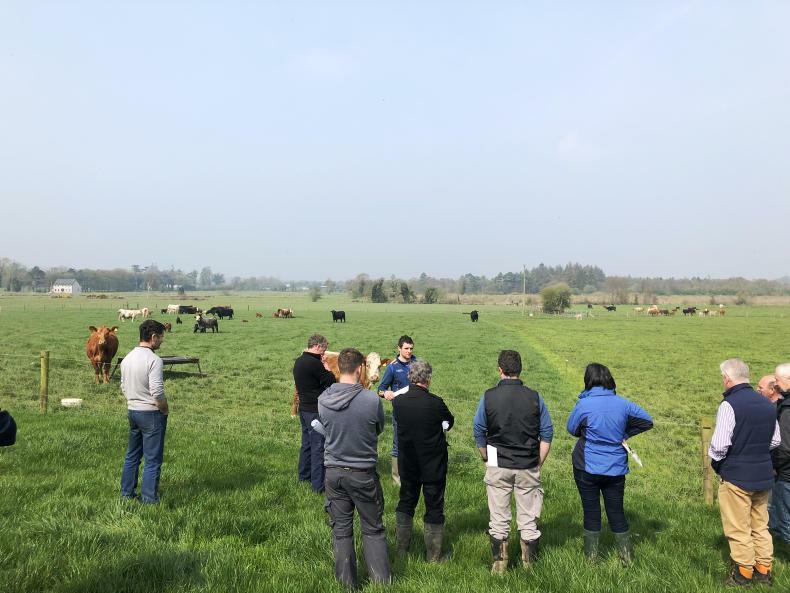 Last week in Multyfarnham, two local groups from the area along with local B&T advisor Carmel Lennon, got an in-depth view of the farm’s system and the reasons for Martin’s swing toward finishing bull’s under 16 months. Other areas looked at on the day were grassland management on the farm, calving 2019 and a look towards the forthcoming breeding season.